FOR the past twelve months, the UK community of NATO Joint Force Command Brunssum International Club have been raising funds for their chosen charity Once, We Were Soldiers (OWWS), which provides much-needed support to the veterans who make up at least ten per cent of the UK homeless population. Fund raisers throughout the year showed the great spirit of the UK community and a huge amount of hard work went into preparing and supporting the events and ultimately raising lots of money! This month, the UK community hosted the final international coffee morning, with a Mad Hatter’s tea party theme, where it was announced that a staggering €3,700 had been raised throughout the year. 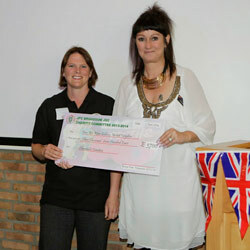 Camilla Davies, UK charity representative, received the cheque on behalf of OWWS. The charity hopes to open transition centres in and around the UK. These centres will provide training and support for those who are about to move into civilian life, operating as a stop gap between the military and civvy street.